Hyundai Glovis has sold a record-breaking 1 million second-hand vehicles via auctions as of the end of November, according to the company on Tuesday. The logistics unit of Hyundai Motor Group has auctioned 1,000,382 used cars since it first started its automobile auction service in 2001. In the past six years, the company has seen an average 4.8 percent rise in the number of used cars sold via auctions annually. It expects the total amount sold this year to be 92,000 by the end of this month, an increase of 3,000 units compared to last year. Hyundai Glovis has three auction houses in the country: two in Gyeonggi Province -- Sihwa and Bundang -- and one in Yangsan, South Gyeongsang Province. There are currently more than 1,800 members, consisting of franchised dealers and approved buyers, who can participate in its auctions. In 2014, the company established its affiliate Autobell to purchase used cars from individual customers. Submitted cars will be inspected for performance before they are put up for auction. The owners then either sell the cars according to reserve prices or put the vehicles up for a competitive bid in which the highest bidder gets to auction off the automobile. 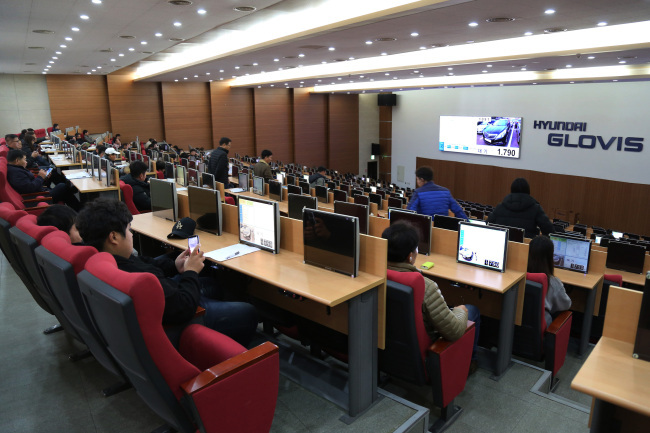 Hyunday Glovis said it plans to expand its auto auction service by establishing an online bidding platform and adopting a mobile performance inspection process for the submitted cars.